The new Camaro ZL1 1LE-based GT4.R already looks pretty amazing, with the addition of big aerodynamic bits and that 6.2-liter LT1 V8. Paint it black and red with a big ‘Murican eagle down the side and it’s just scary good. 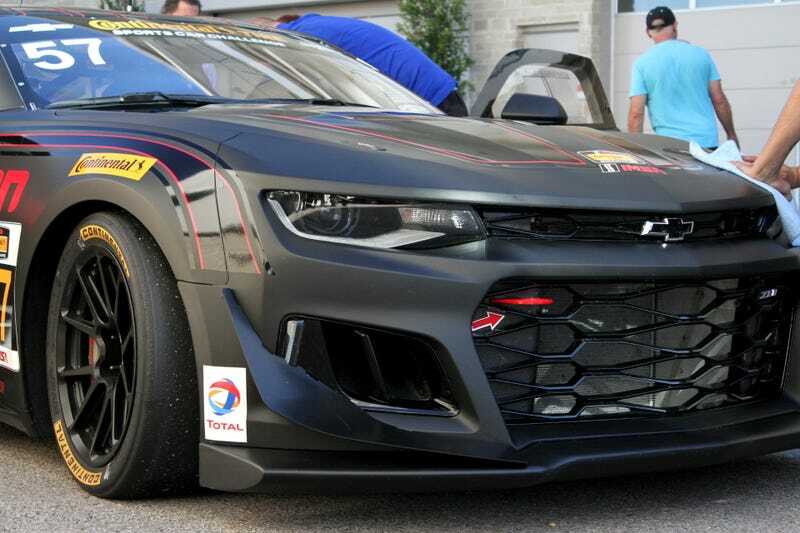 Here’s the Camaro GT4.R the Stevenson Motorsports team is debuting this weekend in the Continental Tire Sports Car Challenge series. We’ve covered the nitty gritty specs of what makes the Camaro GT4.R work before, but it’s Chevrolet’s entry into the worldwide GT4 spec of race cars that keeps a lot in common with the rad road car it’s based on. Aside from the splitter, dive plane and rear wing, the body’s dimensions are the same as the road car. It uses the same Brembo brake calipers on the rear axle as the roadgoing Camaro ZL1 1LE. The suspension was upgraded for racing and solid bushings were swapped in, but it keeps the same geometry as its roadgoing counterpart. Of course, they kept the tried-and-true small block LT1 engine, too—albeit with a different cam for more torque and upgraded main bearings for longevity. It sounds beastly. A new Xtrac six-speed racing transmission and limited-slip differential were added with the goal of making it easy for teams worldwide to pick up a Camaro, race it, and hopefully do some extremely good sounding celebratory donuts afterwards (because Camaro). In the meantime, though, Stevenson Motorsports is one of the early adopters helping shake it down. The car had a little trouble yesterday with high transmission temperatures, but that’s why it’s here: to sort issues like that out. Stevenson has run Camaros before in CTSCC, but their previous Z28-based non-GT4 car was always seen as just a little much for the class by competitors. GM’s main race shop squeeze Pratt & Miller built it with ample factory support, and that raised a lot of eyebrows. While this is yet another Pratt & Miller/GM special, it certainly looks a lot more normal on the inside than the previous car. If they’re up to any factory race car ridiculousness, it’s a lot harder to spot. Anyone who’s ever accidentally driven with a crooked steering wheel will be immediately jealous of this clever steering column mod. A crash box on the outside of the roll cage’s door bar is there to help dissipate energy in a crash. The driver’s seat is fixed to allow the driver to be in the optimal location for weight balance and the roll cage’s geometry at all times, with the steering column and pedal box being adjustable instead. The trick steering wheel with a half-moon-shaped spline that allows it to go on straight every time is a part shared among Pratt & Miller’s other race cars, including the Corvette C7.R race car. The new Camaro has less torque than Stevenson’s old Camaro, but it also weighs less (3,150 lbs) and has more aerodynamic bits to help the big Lego brick cut through the air. Their old Camaro also had a regular manual gearbox, while this one has paddle shifters. Hopefully, it’s also faster. But all of that fancy-tech would be moot if the car wasn’t a fast, ridiculous hoot to drive. Thankfully, that’s not the case. How Does The Heaviest Car Here Win So Many Races?